Random Ramblings: Smashbox in KL, Diamond Botan Brush, Guerlain Christmas 2009 and more! Time for our weekly installment of random ramblings! Smashbox Cosmetics in Malaysia – finally! Remember when I said that Smashbox Cosmetics was coming into Malaysia? Well chicas, they’re IN! 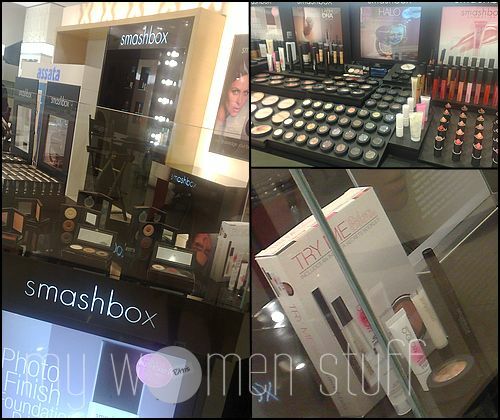 Head on down to Parkson Pavilion Kuala Lumpur where you can check out the Smashbox Cosmetics counter in all its glory. Selberan Diamond Shu Uemura Botan Brush – gawk at it! The Finals of the Shu Uemura Asean Makeup Competition was held at the Pavilion Kuala Lumpur during the week where we saw cutie-pie Uchide-san International Director for Shu Uemura work his makeup magic on 2 models within 5 minutes. 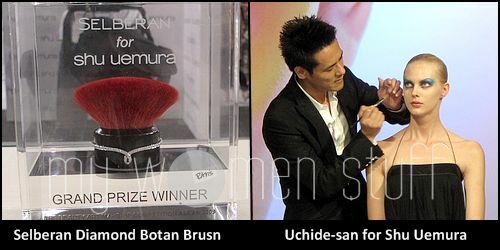 Fascinating makeup aside, the grand prize for the winner captivated me – a specially made Selberan diamond encrusted Shu Uemura Botan brush! Gawk at it! Go on… I did! 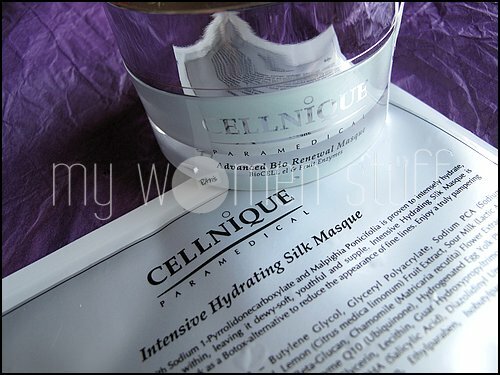 😀 (Prize was won by Adeline Yeoh of Singapore) And while I was gawking, I also gawked at Guerlain’s offering for Christmas 2009! It’s a face wash! What can I say? 😛 Ok, it lathers up well and cleans my skin well, leaving it feeling a little too squeaky clean for comfort. There is a slight cooling feel and a distant scent of tea tree oil. 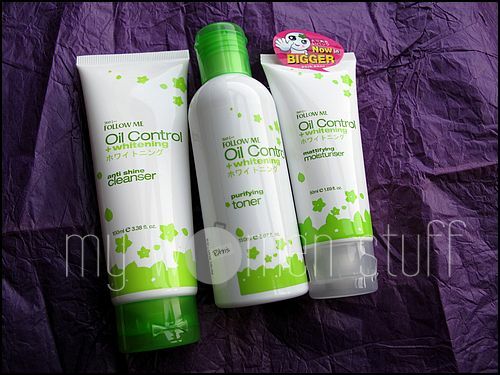 However since its meant to control oil, it means that it works a little harder in that regard to make sure your skin is properly clean. Not sure about the whitening as I did not use it long enough. I don’t know about you, but I had not heard of Hada Labo prior to its launch here in Malaysia. 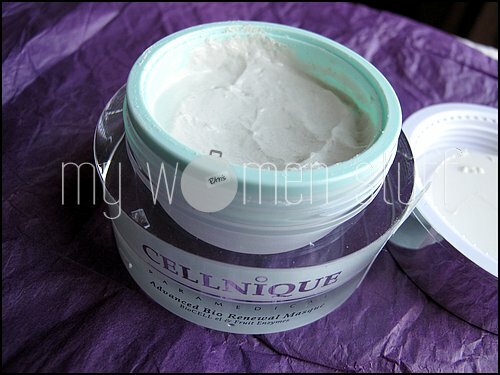 There said it 🙂 Have you heard of this line of Japanese drugstore skincare before this? Apparently, the Hada Labo Super Hyaluronic Acid Lotion is a major hit in Japan, selling one every 4 seconds since its launch there – I’ll let you know if its a visible brand there 😉 Well, curious cats, we’ll soon be able to spot Hada Labo at Guardian Pharmacies starting November 2009! They will probably get more visible over time, but they’ll start out in Guardian for now. 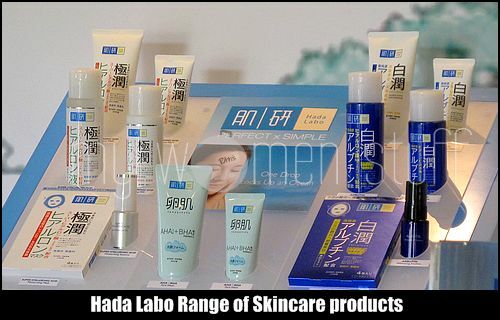 Hada Labo is an affordable Japanese skincare brand under the Rohto-Mentholatum umbrella. Packaging is minimalist Japanese style with LOTS of Japanese words on it. Don’t know about you, but I like it! 😀 Under all that Japanese Kanji and Katakana is an organized clutter that appeals to me. Hada Labo Arbutin Whitening(dark blue packaging) – self-explanatory whitening skincare line with extract of bearberry plant. Hada Labo Super Hyaluronic Acid Moisturizing (white packaging) – to hydrate and nourish skin for smooth radiant crystal clear skin. 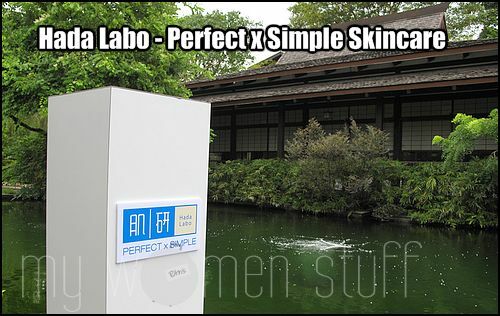 The star product is of course the Hada Labo Super Hyaluronic Acid Lotion with Super Hyaluronic Acid for which their tagline is “1 drop to lock up an ocean” and for which a cute technique of application is advised as will be demonstrated below.